The Languedoc has gone through tremendous changes in the last 35 years from being the region that produced vast qualities of cheap to wines to one that produces high quality wine. Total production has fallen from some 29 million hectolitres per annum to 15-20 million. This transformation has been largely due to the granting of Appellation Contrôlée status to some regions in the 1980s and introduction of the Vin de Pays classification which has led to extensive replanting on more suitable sites of new grape varieties such as Cabernet Sauvignon, Merlot, Chardonnay, Cabernet Franc and Viognie. A real reduction in permitted yields and a reduction on the dependence of red wines on the high-yielding Carignan grape still required in Appellation Contrôlée wines, together with New World wine-making technology and equipment, has resulted in Vin de Pays wines which give the customers what they want - namely, clearly labelled international varietals like Chardonnay and Cabernet Sauvignon. Modern Languedoc vineyards focus on less production, more quality, more grape varieties and more new techniques. Today, Languedoc is one of the most sought-after wine regions in the world. 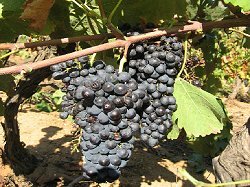 A red Spanish/French grape variety that is widely planted in the region and around the globe. It's popularity is largely due to its high yields, up to 200 hectolitres per hectare. It brings a deep dark red colour and plenty of acidity and tannins to a wine. The grape of the South, Grenache loves sun and heat producing wines that have aromas of red fruit, lavender and thyme. Makes powerful Rose, often blended with Syrah to give big reds, and essential in excellent sweet wines. Also a heavy cropping vine that loves hot and dry conditions. It brings a lighter, more perfumed style to the wines of the region. 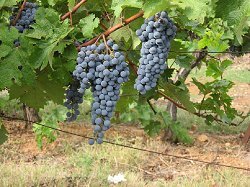 Another grape that thrives in the sunny warm conditions and produces wines with aromas of blueberries, spicy and often coffee tones. A great blending wine with Grenache and Carignan. 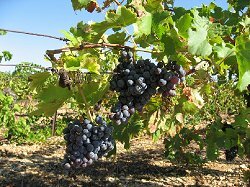 The typical Bordeaux blend varieties, Merlot, Cabernet Sauvignon and Cabernet Franc, can be found in the Languedoc as excellent single variety wines as well as blends. 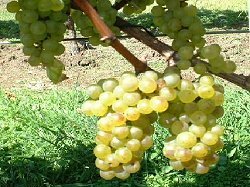 The grape of the famous A.O.C Picpoul de Pinet, a dry white wine to be enjoyed with shellfish. 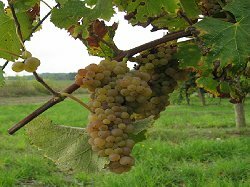 Also known as by the Italian name of Vermentino, Rolle produces a wine with good acid balance and body, fruity with notes of tropical mango and lemon. A wine of growing popularity and excellent with fish and seafood. Types of Wine: A range of wines with quality and variety to please the palate of any wine drinker. Wonderful deep intense red wines blended for a range of grapes, fruity, fresh Rose wines, citrus lively whites, plus quality sweet white wines, fortified blends in red and white.